Chief of Army Staff (COAS) General Qamar Javed Bajwa and Prime Minister Shahid Khaqan Abbasi visited North Waziristan. Pakistan Army’s Inter-Services Public Relations (ISPR)’s Director General (DG) Major General Asif Ghafoor in his statement said that COAS General Qamar Javed Bajwa and Prime Minister Shahid Khaqan Abbasi visited Miranshah and Ghulam Shah. 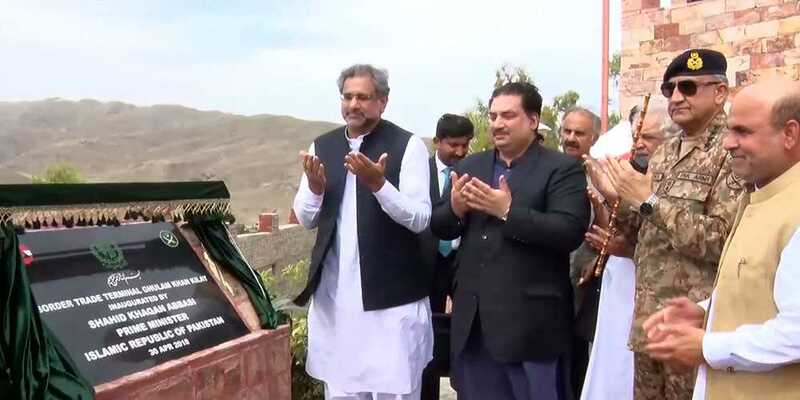 According to the spokesman, Pakistan Army Prime Minister Shahid Khaqan Abbasi inaugurated the recently launched market, bus stop, and Ghulam Khan LNG terminal. Speaking to the tribal elders Jirgah, Prime Minister Shahid Khaqan Abbasi said like the other mega cities of the country, the regional areas will also be part of the progress. The government and all the political parties are agreed on the merger of FATA, and the inclusion of it in the national mainstream is being done rapidly. According to ISPR, Corps Commander Peshawar, Governor of Khyber Pakhtunkhwa Iqbal Zafar Jhagra, and other ministers were also present with the Prime Minister during the visit.